After a 12 year long hiatus (brought on by three successive “unfortunate” experiences), I am now, unfortunately for my wallet, back on them with a vengeance! All it took was one delicious oyster, begrudgingly swallowed, to erase all previous memories and remind me quite how much I loved the little things. True, they are not everybody’s cup of tea, but once you’re converted, you’re a lifer! Now that I have rediscovered them, try as I may I am incapable of ordering anything else once I have spotted them on a menu: I can quite easily, and have repeatedly made an evening out of a dozen. Of course, oysters needn’t be confined to the restaurant experience. There is something rather decadent about having a platter at home- it certainly makes for a glamorous change from your indian take-out! For my French family, Christmas would not be Christmas without a spread of them on the table as an opening act for Christmas dinner. I start getting excited as soon as my uncles’ yearly ritual of opening them up in the kitchen begins. Obviously there are some things to bear in mind if you decide to treat yourself at home. 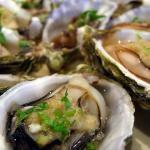 · Like all seafood, oysters need to be eaten as fresh as possible; as they deteriorate every day they are out of the water. Ideally, the same day that you buy them. It is possible, however, to keep them refrigerated by covering them with a damp cloth and making sure they have good air circulation. Be warned, however: I can tell you from experience that you are much better playing it safe with this one. · Do not store oysters in a covered bowl, plastic bag, airtight container, the meat drawer or even in a bucket of water- This will not do the job! 1. Scrub each oyster under running water with a kitchen scrubber. If you are going to serve the oysters raw, they will shuck easier if you refrigerate them well for a few hours before trying. 2. Oysters have very sharp shells; so to protect your hands, use a pair of gardening gloves with rubber palms. The rubber palms will help prevent the oyster from slipping when you are opening it. 3. Using an oyster knife (preferred over regular knives) locate the “hinge” of the oyster. Firmly press the knife in the crack of the shell just on either side of the hinge. 4. Firmly press the knife toward the top of the shell, so as not to pierce the stomach on accident, and firmly slide the knife toward the opposite end of the oyster as the hinge. 5. As you are sliding the knife, gently twist the knife to open the shell slightly. Toward the center you will find a little resistance. This will be a muscle holding the shell closed. Gently slice the muscle to release the top of the shell. 6. The top shell should then lift off with little effort. Place the knife under the meat in the remaining shell and slice the second muscle to release the meat. 7. Keep one of the shells from each oyster for serving if you wish. 8. Run the blade along the inside of the upper shell to sever the top muscle. Discard the upper shell. Similarly run the blade under the oyster meat, cutting the lower muscle and freeing it from the lower shell. The French like theirs very simple with just a drizzle of a red wine and shallot sauce. When I have them in England, however, I always go for the tabasco and lemon option- that little kick helps give an extra "je ne sais quoi" to the salty flavour.